This past Friday, I noticed that my Facebook updates were getting about 20% of the reach that they usually get. Then I stumbled on this article from AdAge where Facebook openly states that fan page owners should expect their organic reach to continue to decline over time… and the best way to get your stuff seen is to pay for reach. 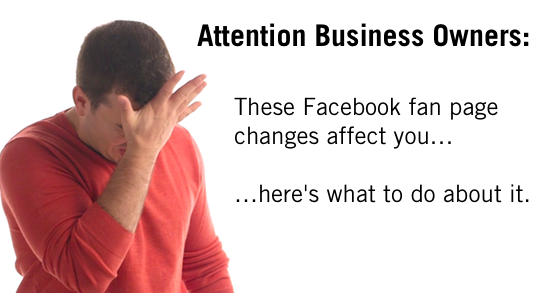 …but here’s what YOU need to do as someone who relies on your Facebook page. If you’re like me, you often share a lot of great content that doesn’t cost anything. And your fans like your page because they want this content. However, Facebook wants us to pay to reach our fans. That’s 100% okay when you’re selling something, but when you’re just giving away valuable content, it does not make financial sense. And since it doesn’t make financial sense to promote content you give away, this means your fans won’t receive the content they want (as demonstrated by them liking your page). They’ll only see what you pay to promote and you’ll only pay to promote sales pitches. This is bad for you and your fans. When people like your page, they don’t realize what goes on behind the scenes. They might like your page because they want recipes, fitness tips, or whatever it is that you do. They don’t realize that Facebook wants you to pay Facebook to give them the content they want. Don’t complain about Facebook and their changes. It’s Facebook and they’re allowed to do what they want, when they want. But you should let your fans know what’s happening, and then invite those fans to sign up for your email list. Because if they don’t hop on your email list, the only time you’ll pay to reach them is when you’re selling something. And they’ll only see sales pitches… not content. This means you may not receive my content anymore via the Facebook page because it doesn’t make sense for me to pay Facebook to send you [insert what you do here]. And then you should link to an optin page. If you’re not building an email list, you’re an idiot. I know that’s harsh, but when companies can destroy your entire business in one fell swoop, you should rely on things you can control. And you can control your email database. (If you want to know who I recommend for email marketing, I recommend AWeber. It’s who I use. Plus it doesn’t hurt that they have a $1 trial. Yes, that’s an affiliate link meaning I get thirty cents when you sign up for the trial. Coffee is on you today, heh ). So make sure you let your Facebook fans know what’s going on so they don’t miss your content. What do you think of these Facebook changes? But I’m worried that isn’t true. Facebook tells me my post is more engaging than other posts I’ve submitted. And they recommend I pay to promote this page. And they’re only showing it to 3,000 people (of 38,000). And that’s why I think you should tell your fans about the update so they can hop on your newsletter. Also – if you know anyone who runs a Facebook page, share this link with them. So they can update their fans as well. Remember, this isn’t about complaining about Facebook. Its their website and they can do what they want. It’s about educating our fans so they can make the decision that’s right for them. If you’re not on the Social Triggers email list, I’d hop on it. You’ll get helpful advice (just like this), weekly Social Triggers TV videos, and the Social Triggers podcast.